For lots of people, an RV is a huge financial investment as it essentially becomes a home away from their home, so to speak. An RV will give great adventures and pleasurable moments wherever you park it. RV batteries no doubt are an essential necessity if you’re going to run and operate your motor vehicle. Sadly, when parked outdoor, your fun may be rudely interrupted by the unfortunate situation of battery theft. Perhaps the only 100% sure way of averting the theft of your RV battery is remove them from car, which is not easy as you move or camp frequently. Whether you’re on your road trip or your RV has been stored on your private property, to be forced to deal with an issue of battery theft can be traumatizing to say the least. It becomes a real damper on the excitement of your enjoyment particularly when you think of the how much your wallet will be dented to get a new battery for your RV. The unfortunate thing is that battery theft from parked RVs is getting very common as it makes an easy and quick profit for the thief. If not properly secured and protected by the reliable RV battery lock obtainable from battery shackle, very easily you may find yourself without your battery. Visit us at RV Battery Shackle (www.batteryshackle.com) to view our various RV battery lock options as well as travel trailer locks. This comprises of a versatile battery locking bracket which is designed to fit around the battery box and the angle iron using securing straps. The bracket lock will require that you obtain a separate strong padlock because it is a heavy duty lock. The RV battery shackles have been so designed to offer you optimum security for your batteries and prevent them from being swiped by a thief. 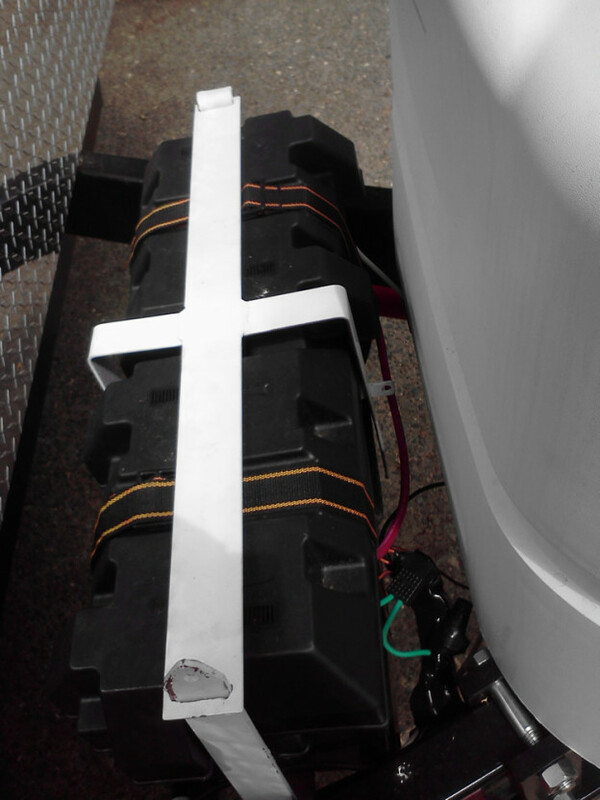 They are easy to install using securing straps which will give adequate cover to both of your RV batteries irrespective of their sizes. Because RV battery locks are manufactured using quality material made of steel, the devices get firmly fixed into place which no ordinary criminal can disable easily without using strong devices like a cutting torch or bolt cutters. In essence, we offer you the ideal solution to any concerns you could be having about the security of your batteries. Our RV battery lock security (www.batteryshackle.com) is the way to go. Any owner of a RV knows already that besides being expensive to replace your batteries, it also leaves you dangerously exposed in case you are stranded in a risky road location without a running battery. This is why we use a battery shackle with a 6 volt battery shackle to secure the straps. 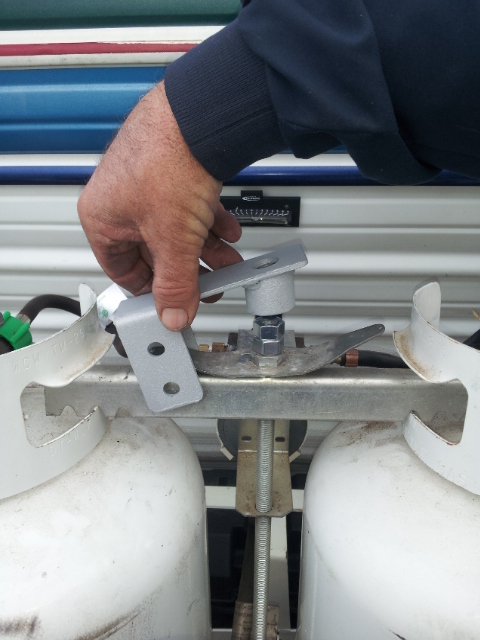 Another viable alternative would be propane locks installed in your RV. Whether you’ve only decided to be on the road for a couple of days or perhaps the road nomad life is your thing, an RV battery shackle lock security system can make you feel additionally secure as it potentially saves you money and leaves you to take pleasure in each moment of your camping and the road trip knowing your battery has been fastened using strong securing straps. Contact RV battery lock security batteryshackle.com today so that you can be equipped with all the information and details you require about this innovative and cost-effective solution that will preserve your batteries for many years ahead. We guarantee quality installation of your heavy duty lock for your RV. This entry was posted in RV Battery Lock on August 17, 2015 by Optimize Worldwide. Do you find yourself worrying too often about your RV battery? Or are you tired of having your trip ruined because some thief got a hold of your car’s batteries? If the answer to any of those questions is yes, then BatteryShackle.com is the end of all your problems. With our highly sophisticated RV battery locking system, you don’t have to be worried or annoyed because of a thief ever again! At our store, we have revolutionized the concept of locked battery with our new product. The technology is impeccable and tested by highly skilled professionals who have verified to its premier quality and safety. 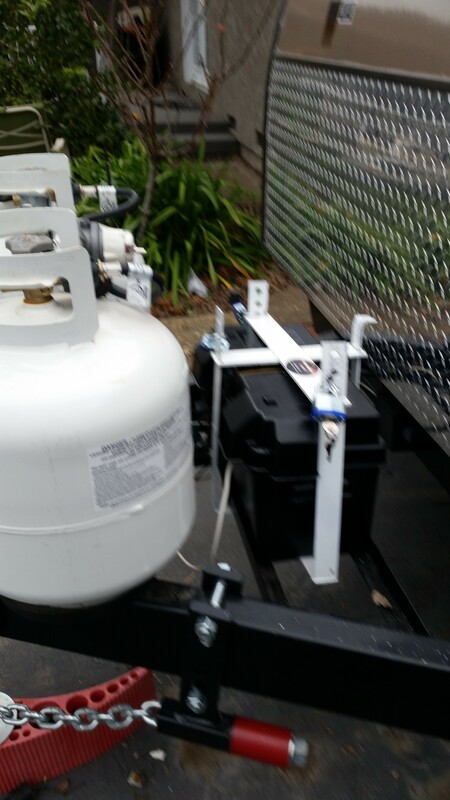 This propane/battery locker has just been released on the market and is by far the top most ranked product on both Google and Amazon further testifying to our world class standards. Recent research and surveys have shown that the crime of stolen RV batteries is on a huge rise across America and you could easily be the next target. It hardly takes 30 seconds to steal a battery, but if you’re smart and careful, you can secure the same in less time than that. At batteryshackle.com we want nothing but the best for our customers, which is why as an introductory offer, if you buy the lock now, you can walk away with a free set of padlocks. So waste no time, and relieve your stress with our perfectly safe locks and walk home with a broad smile on your face! Drop us a message or a call. We would love to hear from you. 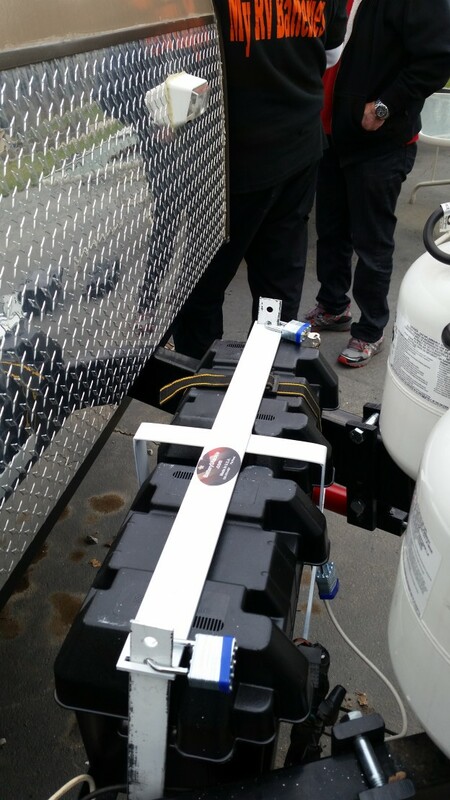 This entry was posted in RV Battery Lock on August 11, 2015 by Optimize Worldwide. Living the RV life, is a favorite pastime for many, but things aren’t quite as simple as they once were when people would set out on the open road with the bare minimum. Now, there are an overwhelming amount of choices when it comes to features that you can add to your recreational vehicle and take with you. While some may seem more frivolous depending on your preference, others are well worth the investment and can add security, fun and peace of mind to your travels. From RV battery locks to GPS and energy efficient solutions, the options below are some of the top must-have accessories for RV owners. Unfortunately, the days of leaving your doors unlocked and being able to trust most people are over. An increase in theft means that criminals are coming up with new schemes for breaking the law, and stealing RV batteries is one of them. Any RV owner already knows that not only is it not cheap to replace these batteries, but it can also leave you in a precarious situation if you’re out on the road somewhere stranded without a battery. A heavy-duty RV battery lock is a quick fix for this escalating problem since it will deter thieves and keep them from being able to access your battery compartment even if they go ahead and try. Solar panels aren’t just a popular trend for immobile structures. The benefits extend to recreational vehicles as well. Traditional generators are annoyingly noisy, may not be able to be operated at certain locations and cost a lot to keep refueled. Solar panel systems, on the other hand, emit no sound while producing sufficient energy to charge everything you need. No matter how much you may try to avoid all the advancements in technology, you must admit that there is a lot of convenience in most innovative ideas and products. With that being said, it’s time to put away your old maps (unless you’re on the hunt for treasure) and install a GPS system. It may be fun to go off the grid for a while, but when it’s time to get back on track, you don’t want to be lost in the middle of nowhere for hours. Hopefully, your RV travels will take you anywhere and everywhere, but that means possibly getting caught in some less than desirable weather. Having a weather radio allows you to stay informed of impending weather conditions and take cover when necessary or plan your day’s itinerary accordingly. This device can prevent your trip from being ruined at a moment’s notice. Smart RV is a fairly new service that offers several useful features. It will track the movement of your vehicle, which not only keeps friends and family at home updated on your whereabouts, but also comes in handy when it’s moving and you’re not the one driving it (as in it’s being stolen). It will alert you of the movement and assist in locating it. In addition, Smart RV will notify you of low battery levels and create a journal to document your adventures that you can then share with whomever you choose. Whether you’re only hitting the road for a few days or have decided the life of a nomad is right up your alley, an RV battery lock and these other accessories can go a long way in making you feel more secure, saving you money and allowing you to enjoy your journey to the fullest. 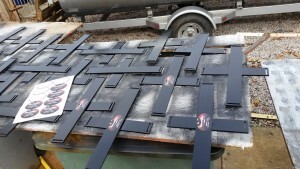 This entry was posted in RV Battery Lock on August 13, 2014 by paul holmes.